alaTest has collected and analyzed 87 reviews of HP Pro 3500 C9J26UT#ABA Desktop PC - 3rd Gen. Intel Core i3-3240 3.4GHz, 4GB DDR3, 1TB HDD, DVDRW, Windows 7 Pro 64-bit / Windows 8 Pro 64-bit, Keyboa. The average rating for this product is 4.6/5, compared to an average rating of 4.2/5 for other Desktops for all reviews. Views about the size and design are overall positive. The reliability and usability are also appreciated. We analyzed user and expert ratings, product age and more factors. 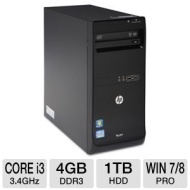 Compared to other Desktops the HP Pro 3500 C9J26UT#ABA Desktop PC - 3rd Gen. Intel Core i3-3240 3.4GHz, 4GB DDR3, 1TB HDD, DVDRW, Windows 7 Pro 64-bit / Windows 8 Pro 64-bit, Keyboa is awarded an overall alaScore™ of 85/100 = Very good quality. Bought this to add to a network in my office of 7 computers. Phasing out XP based units. came with 7 Pro and works very well. Wish it came with Microsoft Office however that was about a $79 add on. Very pleased with this computer. The price was excellent and would buy another HP for my next computer. I bought this for my wife as a general home computer. She uses it for internet browsing and remote desktop access to work. This system works well for her. The only weak spot is the video. OK for what she uses it for but weak if used for gaming. Core i3, 4gb RAM, limited bloatware, and Windows 7 Professional. Can't go wrong here. Bought this computer for my wife who was not happy with her old computer, plus it has xp on it....Happy wife happy life. This is a Great computer for home use and windows 7 runs very well on this computer. Great product at a Great price and fast shipping..
We purchased this computer for our school auditorium sound booth. It is perfect! Runs great for music and videos! Thank you for the great value. Great Machine for Home Use! We are thoroughly satisfied with our purchase! Easy set-up, right out of the box. Plenty of storage and extra slot to add more RAM! Well worth the money. Upgraded from an old E-Machine and could not be happier.